Harmony and Asymmetry Balance. Colors should look harmoniously. Use no more than 3-4 shades in colour. The idea is that an off-centre composition is more pleasing to the eye and looks more natural than one where the subject is placed right in the middle of the frame. The focal point should draw the viewer’s eye to it. Place the focal point on one of the ‘intersection spots’ from the Rule of Thirds. Other elements in the painting should lead they eye towards this point. There are many different types of line – straight, diagonal, curvy, zigzag, radial etc – and each can be used to enhance our painting’s composition. For a strong composition, you want values to be in quite different amounts, not similar. Try this rule to start: “two thirds, one third, and a little bit.” For example, two thirds dark in tone, one third light in tone, and a small area or object that’s mid-tone. Play of light creates all around, both mood and contrast, and also appoints significant. By cropping tight around the subject you eliminate the background “noise”, ensuring the subject gets the viewer’s undivided attention. Having an odd number of elements in a composition means your eye and brain can’t pair them up or group them easily. There’s some how always one thing left over, which keeps your eyes moving across the composition. Avoid neat and orderly arrangements of elements. Varying the space between the elements in your composition, the angles they lie at, and their sizes makes a painting more interesting. Kissing means just touching. Elements must either be definitely apart or definitely overlapped. Kissing creates a weak, connected shape which will distract the viewer’s eye, causing a momentary pause as they puzzle it out. Either cool or warm, but not both. Do the elements in the painting’s composition feel they belong together, or are they separate bits that just happen to be in the same painting? Help create unity by glazing over the whole painting with a single color; or by casting shadow; or by a bit of repeated color; etc. Tone of background is always colder than forward to show the depth or distance. Don’t get stuck in a rut and use the same composition all the time, no matter how successful it is. Vary where you put the horizon line, where you put the focal point, swap between portrait (vertical) and landscape (horizontal) shaped canvases. Our eyes search asymmetric decisions and not only under the form, but under color, contrast and rhythm. Don’t necessarily fill up one big area with one color, even if it is one color. You can make it much more interesting by mixing different versions/value of one color – as long as they are all the correct value. Currently I spent about 3~4 hours on average on each small painting. Many random strokes produce muddy colors. 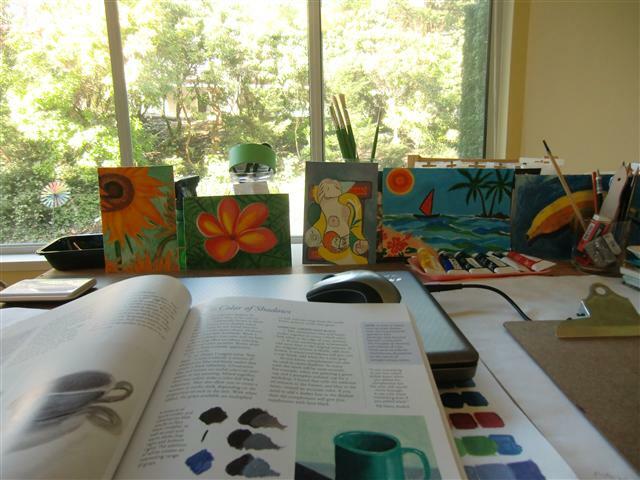 I found another artist (Patti Mollica) who is teaching people on how to paint fast, loose and bold. Wish I could have chance to join her workshop. She covers the following topics which are areas that I need to improve. Today I was checking a few paintings that I painted last month and realized that I can improve them. I changed some shading colors, soften the edge and adjust values in certain areas. They look better after all the adjustment. I’ve been improving and I am happy with that. Currently I mainly paint on canvas panels. I have been thinking how to frame my paintings nicely and economically. Those canvas panels actually can be fit into regular photo frames nicely. 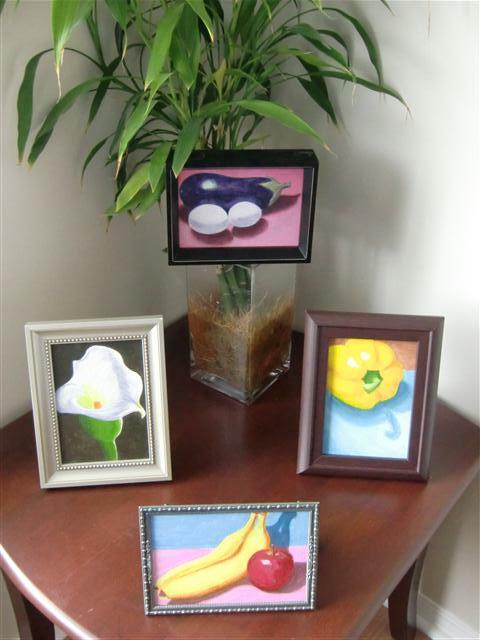 Below are some of my paintings in frames. The best way to see true color is with a color isolator, holding it about six inches from your eyes, close one eye and position the hole so that you can see the color of the subject area you are judging. This isolator is a small piece of color that you no longer see a thing but only a specific color note. When looking through the color isolator, do it fast. Trust your first quick impression. The color isolator will help you visualize without preconceptions. I’ve seen an intensive painting basic skills building class that offers the following training. I wish I could join such an class. Unfortunately I haven’t found a class like this in my area. effective paint handling and brushwork (applying focused, deliberate marks on the canvas rather than a random “figure it out as I go” approach). Below are a list of tips I learned from one of my favorite artists, Carol Marine. In order to be accurate with value you must constantly compare every value with every other value in your subject, rather than just values that are very near each other. Try to simplify the values into big shapes in your head so they’re easier to deal with. Work from life (because cameras skew value a lot) and before you begin ask yourself: What is my darkest value? What is my lightest value? Where do the others fall on the value scale? How do all the values relate to each other? If you look through your viewfinder at your subject and find you have no contrast to speak of, or two values are very equal in amount, try changing something: a different background color (actually change out the paper or cloth you are using); the angle of the light; the objects themselves; the number of objects; crop in closer or further away; etc. My studio is in the kitchen area. I use the lunch table as my working desk. It is facing the window. I can see the trees and blue sky when I am painting. 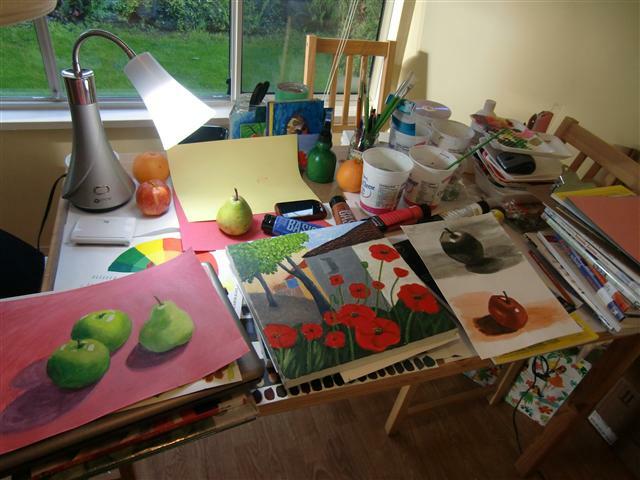 I am happy with my little studio – It’s simple and bright! I am adding more stuff gradually.